Six tapestries from the Story of Gideon series are displayed in two adjoining rooms of Albarracín’s Diocesan Museum, which itself is situated in the former Episcopal Palace next to the cathedral. 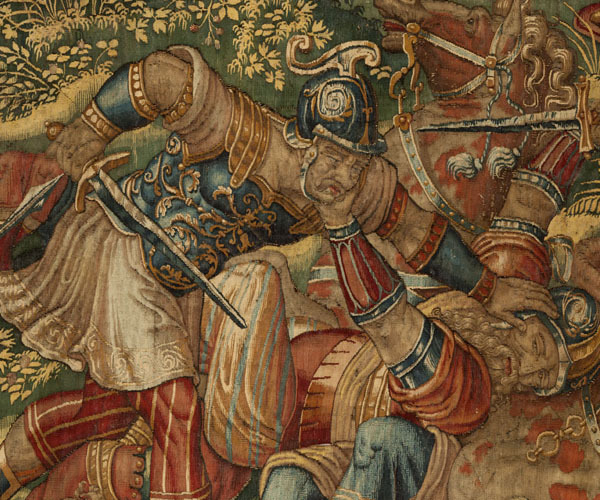 The series was originally formed of eight pieces; with the passage of time, one very deteriorated tapestry was rejected, although some fragments of it were saved and attached to the fifth tapestry in the series, ‘Gideon and his men playing trumpets’. 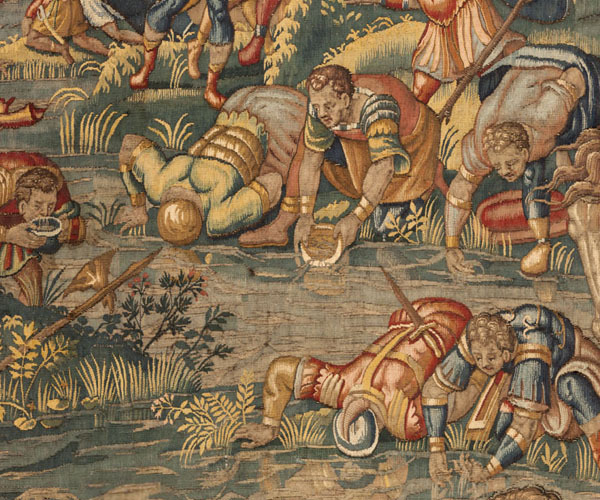 This fifth tapestry, which became similarly worn, has been removed from display for restoration. 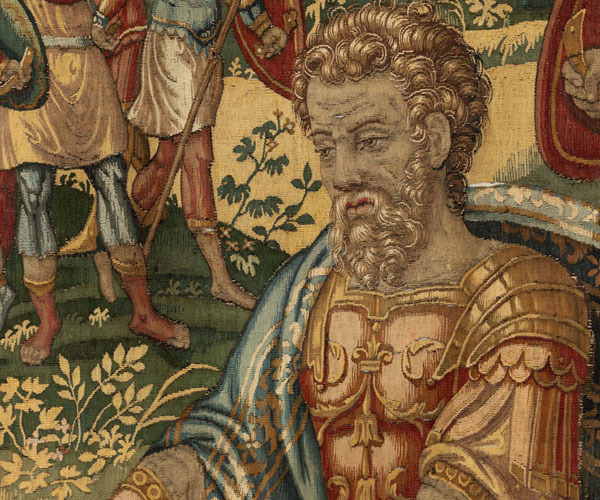 Tapestries devoted to the story of Gideon, a biblical warrior and judge, are not common, and would probably have been even less common had it not been for the mythological story of Jason and the Argonauts. Jason, an exemplary hero, reached the end of the earth, Colchis, to claim as his own a golden lamb’s fleece which was guarded by a fearsome dragon. Aided by the enchantress Medea, he succeeded in his mission and returned with the Golden Fleece. In 1430, the Duke of Burgundy, Philip the Good, established a chivalric order, the Order of the Golden Fleece. The name, which referred to the mythological story of Jason, proved too heathen for a Christian institution, and as a result, it came to refer to the story of Gideon. According the Old Testament, God ordered Gideon to spread a fleece out on the ground, which miraculously soaked up all the morning dew while the ground surrounding it remained dry (Judges 6, 36-40). Following this “Christianisation” of the story, the Duke of Burgundy commissioned a tapestry on the subject – which is now lost – in 1468. 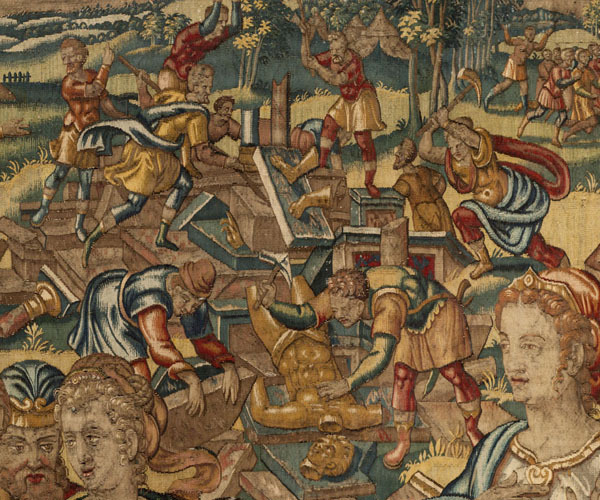 Another series, weaved in Brussels before 1562 for Cosimo de’ Medici, Grand Duke of Tuscany, has also been lost. The Medici series was brought to Spain by Francesco, the Duke’s son, when he married Joanna of Habsburg, the youngest daughter of Emperor Ferdinand I of Austria. 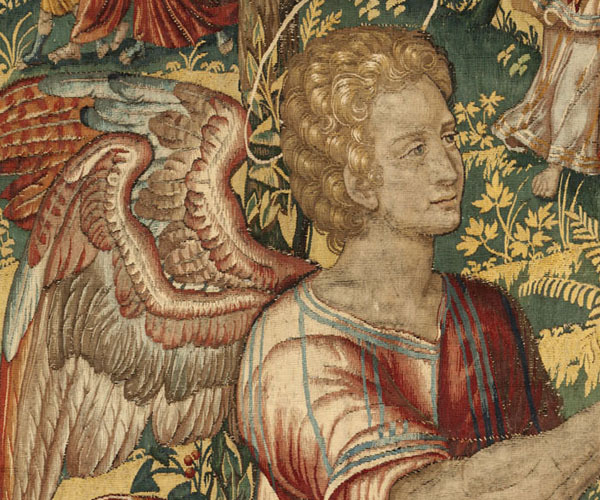 Another series about Gideon, which was weaved in Oudenaard in 1578, is kept in Hardwick Hall, and consists of large pieces based on the designs of the Medici series. The series kept in Albarracín was manufactured in Brussels in the workshops of Frans Geubels, whose monogram can be found in the tapestries, in the third quarter of the sixteenth century. A short time later it must have been passed on to the cleric Vicente Roca de la Sera, a native of Valencia, who in 1605 was appointed Bishop of Albarracín. When he died in March 1608, he left to the cathedral as a bequest “a valuable collection of tapestries [the Gideon series], a costly terno [a set of ecclesiastical garments used in the Catholic mass] and an exquisite pax-brede encrusted with emeralds and other precious stones…”. 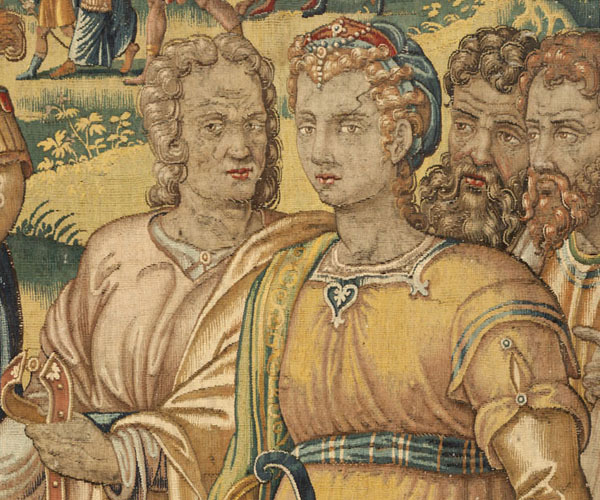 Weaved in silk and wool, the tapestries which form the Story of Gideon were produced from cartoons believed to be by the painter Maerten van Heemskerck (1498-1574). These tapestries show substantial similarities with the painter’s work: monumental figures placed into fertile nature scenes, with different scenes taking place in the background. A particularly wide border is similar to the method employed by Jan Vredeman de Vries (1527-c.1607). It is formed of architectural, geometric and plant motifs, along with some animals and medallions with allegories of Christ, such as the pelican, which was believed to feed its chicks with its own blood. In the selvage of some of the tapestries we can see the B?B mark, which tells us they were manufactured in Brussels, in Brabant. The monogram of the weaver, Frans Geubels, can also be seen. He was responsible for such magnificent series as Romulus and Remus (kept in Vienna) and the History of Cyrus (National Heritage Series 39), although the present series is just as valuable as those. M. Mora, “Tapices de Albarracín”, Revistas de Archivos, Bibliotecas y Museos, Vol. IX (1905), pp. 97-107. C. Rábanos Faci, Los tapices en Aragón, Zaragoza, 1978. A. Almagro Gorbea and E. Arce Oliva, Palacio episcopal de Albarracín, Zaragoza, 2011.